This post, Slow & Steady, by Dr. Adam Feldman, first appeared on March 21, 2018 8:30 pm at https://empiricalscotus.com/. The Supreme Court is slowly plodding through the 2017 term. The court began the term at a historically sluggish pace, and although the justices have picked up the pace in certain areas, other signs point to the possibility that the court’s output this term will continue at the same rate. First, looking at the court’s signed decision output since the 1946 term, the trend is clearly downward. This term, the court is well below its average output since 1946 of 33.11 opinions by the beginning of March. 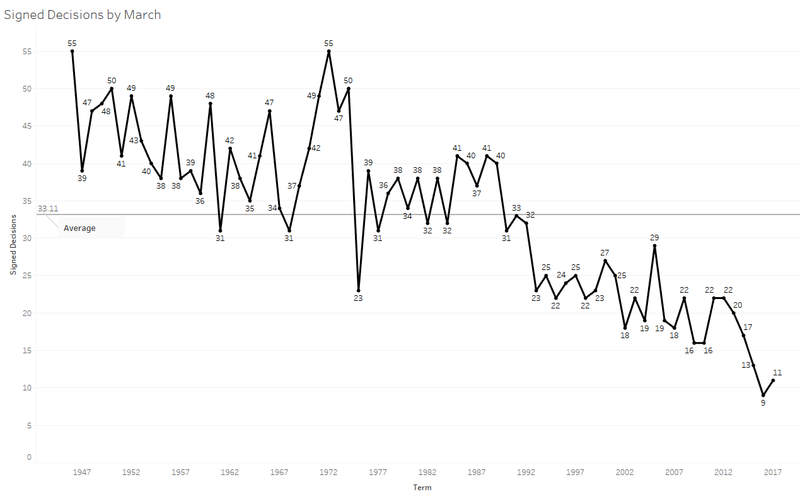 The court’s output overall, however, has also trended downward since 1946, so this result is not terribly surprising. (This point is supported by the bottom graph on this page from the Federal Judicial Center.) Although the court has been slow to release opinions this term, its output by the beginning of March was even slower in the 2015 term. The court’s output looks a bit different if it does not release its next set of opinions until the expected date of next Tuesday, March 27. 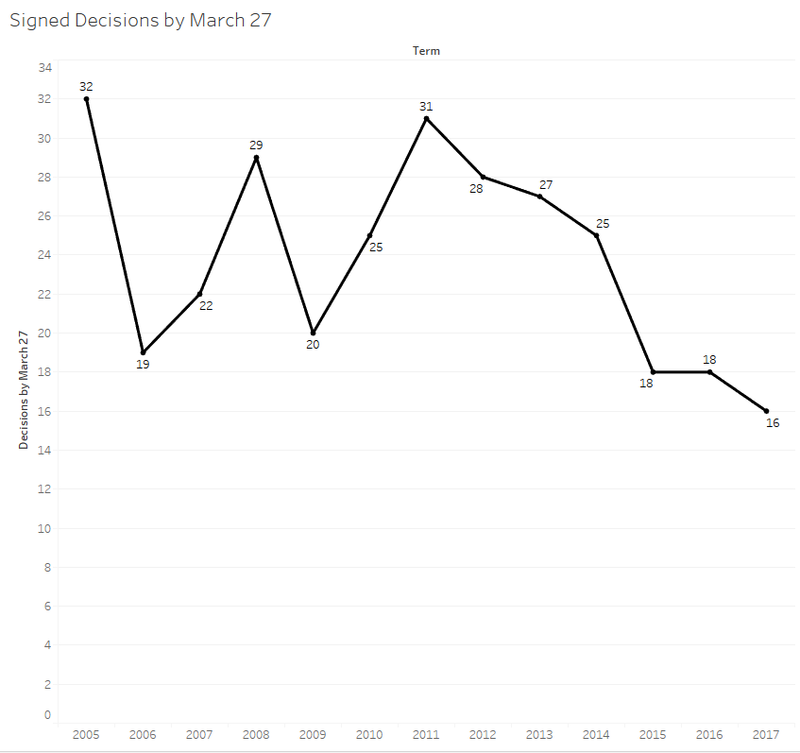 If this is the case, the court will have released the fewest signed opinions by March 27 for any term since Chief Justice John Roberts was confirmed. 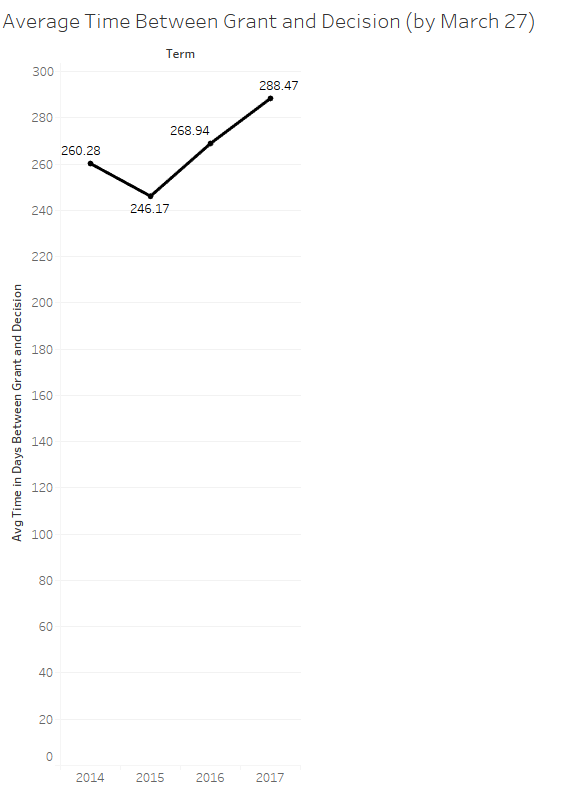 Still, as the figure below shows, the court has been relatively consistent across the Roberts court years in the amount of time the justices have taken between oral arguments and releasing decisions. The court’s deliberate pace is evident in other areas as well. 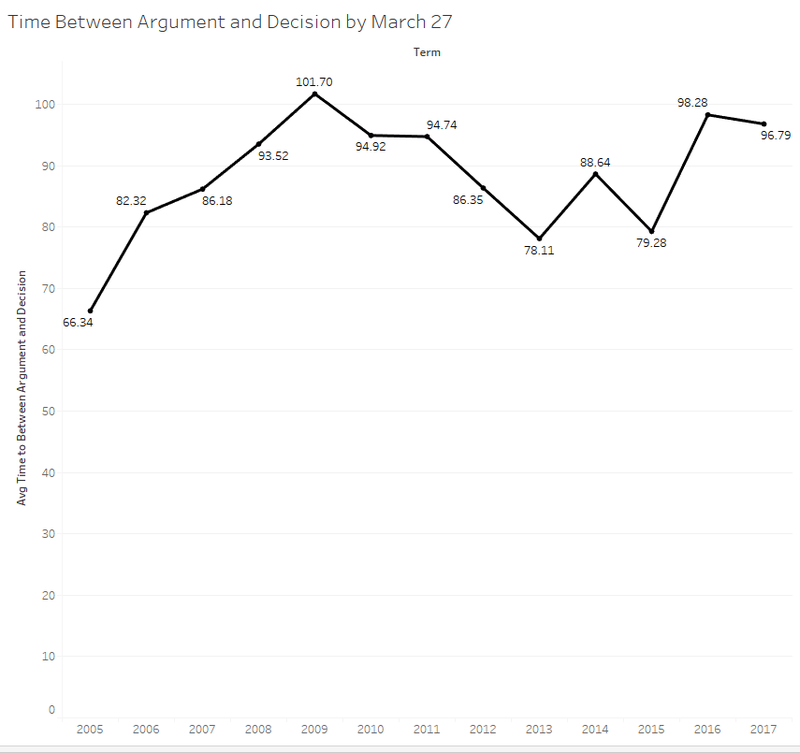 If we look at the amount of time the justices have taken between case grants and decisions for the 2014 through 2017 terms, this term ranks as the slowest. Moving on to the justices, seven of the nine have written one or more majority opinions so far this term. Although Justice Anthony Kennedy and Roberts are absent so far this term, they have played leading roles in authoring decisions at the beginning of terms in the past. This becomes apparent if we expand the view to majority opinion authorship for opinions released by March 27 between the 2014 and 2017 terms. The distribution of early term opinions clearly favors Justice Sonia Sotomayor, but the rest of the justices, aside from Justices Antonin Scalia and Neil, Gorsuch, who were not on the court for this entire period, authored between seven and 10 majority opinions, according to the figure above. The justices have their work cut out for them this term. There are many cases to decide between now and the last day of the term on June 25. While it is unclear whether the justices will set any records for slowness across the entire term, the court is continuing to trend downward in multiple output metrics, which lays the groundwork for such a possibility.